"Read this book, do what it says, and discover exactly where you fit in." "If you want to belong, read this book." "From the moment I opened this book I was hooked. This book is caring and tender, challenging and action-driven. It is now on my recommendation list." How is it that the internet connects us to a world of people, yet so many of us feel more isolated than ever? That we have hundreds, even thousands of friends on social media, but not a single person to truly confide in? 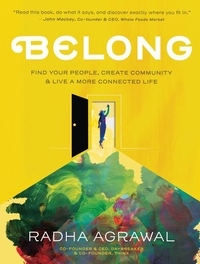 Radha Agrawal calls this "community confusion," and in Belong she offers every reader a blueprint to find their people and build and nurture community, because connectedness--as more and more studies show--is our key to happiness, fulfillment, and success. A book that's equal parts inspiring and interactive, and packed with prompts, charts, quizzes, and full-color illustrations, Belong takes readers on a two-part journey. Part one is Going IN--a gentle but intentional process of self-discovery and finding out your true energy levels and VIA (values, interests, and abilities). Part two is Going OUT--building on all that you've learned about yourself to find those few special people who feed your soul, and discovering, or creating, the ever-widening groups that align with your aims and desires. As the Co-founder and CEO of the popular global morning dance community Daybreaker, Radha Agrawal developed an immense offline community with her team of Community Catalysts in 25 cities and on a dozen college campuses around the world by creating a physical space for people to connect, self-express, sweat, and dance. Now, Radha offers the life-changing strategies, tips, and tricks for making friends that will light your fire and give you the exhale of "Ahh, I'm home." "Radha has written a book that's fun to read, easy to digest, and embodies deep wisdom. This isn't just a book I'm endorsing. This is a book that I want to buy multiple copies of because I have so many friends and acquaintances that will benefit from it. It's the first book I couldn't wait to finish reading it so I could give my copy to one of my friends to read the same day."